I posted this recipe back in 2008, when I was a young blogger. 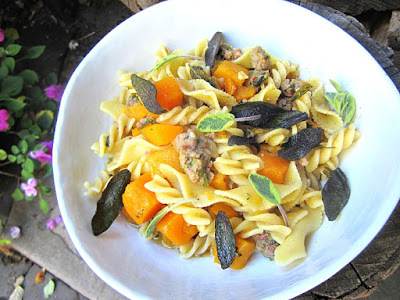 It's my go to Autumn pasta dish for company. Easy to put together and always a favorite for Sunday night dinners. I've changed the recipe over the years and omitted the white wine and now just use chicken stock (from the box is ok). I buy my sausages from a local Italian butcher, and he had better never go out of business because I can't eat sausage from anyone else. I always say, make friends with your butcher. I am lazy, and do everything in one pan......I even serve out of the pan. You will need 3 pans for this dish. One to boil your pasta, one for the squash sausage mixture, and one skillet for the sage and butter. In a large, heavy skillet, heat olive oil and cook the onions and sausage pieces about 5 minutes on medium heat until all the pink is out of the sausage. Add in the garlic and cook another minute. 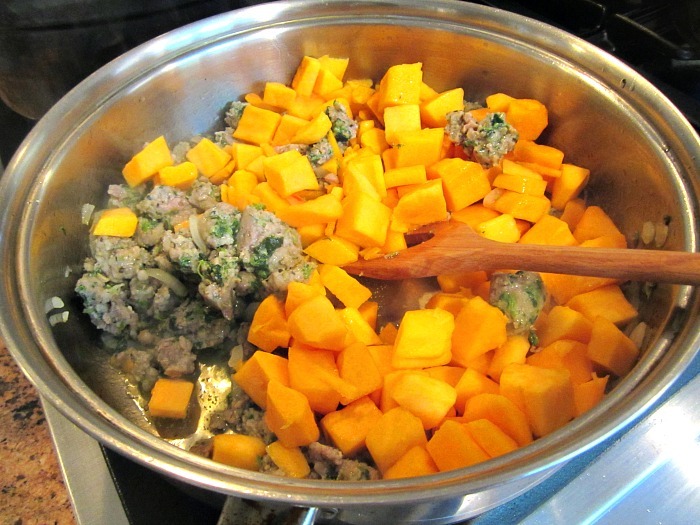 Add in the diced squash and season with kosher salt & red pepper flakes. Pour in all the chicken stock and bring to a boil. Turn the heat down to simmer and cook the squash and sausage mixture for 10 minutes or until squash is tender. Meanwhile, cook the pasta. When pasta is ready, drain and toss w/ the butternut sausage mixture. 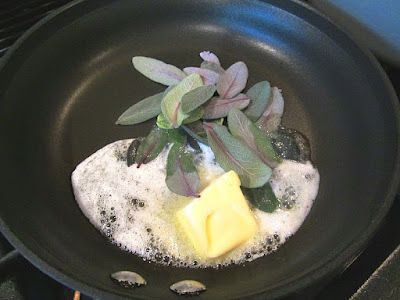 In a separate small skillet, heat the butter and sage leaves.....the butter will sizzle and the leaves will get nice and crispy. It only takes about 2 minutes. Pour the crispy sage leaves and butter on top of the pasta and serve in bowls. Parmigiano Reggiano is not necessary, but always welcome. One of my top 10 recipes. The recipe that hooked me as a "Stacey Snacks" fan. So good. I'm cooking for a friend with cancer and her son would love this! My neighbor has sage in her greenhouse and gives me her butternut squash so I'm set. I will definitely make this! Yummy. This looks perfect for the millennial. Sending her the link! Yay I miss your pasta recipes! I was actually thinking of making something like this for dinner Thursday, perfect timing. Just happened to pick some pre-frost sage last night from our kitchen garden so I had the herb waiting for an idea and you delivered this idea! Will fry it later and serve something similar to your recipe, and may add some pickled mustard seeds to the mix. Thank you. I buy my pork sausages (broccoli rabe is the best) from Vacchiano....they are at the Madison Farmer's Markets on Thursdays and for a few more weeks at the Summit Market on Sundays.